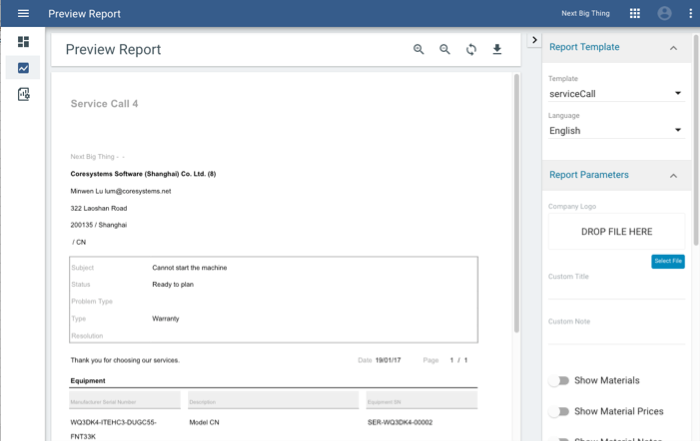 The Preview Report screen is a powerful feature used to view and generate reports for records created and managed in Field Service Management and Jaspersoft Studio. Reports that have been created in Jaspersoft Studio can be previewed and downloaded in the Preview Report screen. Additionally, the Preview Report screen is also used to view and generate reports for checklist templates, activities, and service calls. Company Logo Here, you can select an image file of your company logo to be displayed in the report. Custom Title Here, you can input a custom name for the report. This will overwrite the object name displayed in the report. Custom Note Here, you can input a custom note to be displayed on the report. This note bears no relation to any notes assocaited with the data object. Show Materials By selecting this option, materials (items, articles) will display in the report. Show Material Prices By selecting this option, the price/s associated with the material/s will be displayed in the report. Show Material Notes By selecting this option, notes associated with the material/s will display in the report. Show Efforts Efforts are generally the time-based tasks associated with an activity or service call. By selecting this option, the efforts will display in the report. Show Start/End Time By selecting this option, the start/end time will display in the report. Show Chargeable Efforts Chargeable efforts are efforts that can be invoiced to the customer. By selecting this option, all chargeable efforts will be displayed in the report. Show Effort Notes Effort notes are the notes left by technicians for efforts. By selecting this option, all notes associated with the effort will be displayed in the report. Show Mileages Mileages are the traveling/driving distance/s entered by the technician. By selecting this option, all mileages will be displayed in the report. Show Mileage Notes Mileage notes are the notes entered by technicians when entering mileage information in the mobile application. By selecting this option, all mileage notes will be displayed in the report. Show Activities Service calls can consist of one or more activities. By selecting this option, all activities associated with the service call will displayed in the report. Show Activity Notes Activity notes are the notes associated with the activity entered by the dispatcher or the technician. By selecting this option, all activity notes will be displayed in the report. Show Signature The signature provided by the customer. By selecting this option, the customer signature will be displayed in the report. Show User-defined Fields User-defined Fields (UDFs) are fields present in an Enterprise Resource Planner (example: SAP Business One) not present in Field Service Management. By selecting this option, all UDFs will be displayed in the report. The most commonly-generated report in Field Service Management is the Service Call report. This artefact generally includes the key details related to the service call that can then be used to mark the service call’s completion. 1 From the Service Calls tab you can select the service call record for which you would like to generate a report. 2 After selecting a Servie Call record and selecting Edit, you can then select the preview report option from the action list in the top pane. The application will then redirect you to the Preview Report screen. 3 From the Preview Report screen you can upload a logo, add a custom title, and select which parameters you would like to be displayed. When complete, you can then select the button to generate the report. 4 After a report has been generated, it can then be downloaded by selecting the download button. Service call reports can be downloaded in PDF format. Once a report has been generated, it can then be downloaded and/or shared. Reports generated from activities and service calls can be downloaded in PDF. Reports created in Jaspersoft Studio can be downloaded to PDF and excel format.